Mike Bara, space expert and author of ANCIENT ALIENS ON THE MOON takes a hard look at the Kennedy assassination and the race to the Moon. 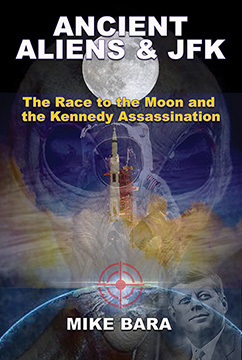 Bara examines never-before-revealed clues to the real reasons behind the Kennedy assassination, the true objectives of the Apollo program and the shadow government hidden agendas that led to Kennedy’s death in Dallas. Relying on heretofore unavailable records culled from the recent Kennedy assassination document dump, Bara shows the secret connections between key assassination figures like Lee Harvey Oswald, Lyndon Johnson, and highly placed figures inside NASA who had reasons to want Kennedy dead. He examines the relationship between JFK and MJ-12, JFK’s “Grand NASA Plan,” plus NASA and the Parallel Secret Space Program. Bara examines the “magic bullet” hypothesis and identifies the mysterious “Badge Man” who appears in photos of the grassy knoll. Bara also looks into the bizarre billion-dollar Treasury bonds that Japanese businessmen attempted to deposit in a Swiss bank that had depictions of Kennedy and the Moon on them. Is the wealth of the Moon being used as collateral by the USA? The book digs deeply into Kennedy’s silent war with shadowy deep state figures who were desperate to shut down his “disclosure” agenda. Finally, Bara examines the truth behind the Apollo missions by looking at recent revelations like “Apollo 20,” Kubrick’s Odyssey and rumors that the landings themselves were faked. Includes an 8-page color section. Now Available! ANCIENT ALIENS AND JFK: The Race to the Moon and the Kennedy Assassination By Mike Bara. 248 Pages. 6x9 Paperback. Illustrated. Color Section. Notes.